ABA Productions presents Tall Stories’ irresistible sell-out adaptation of The Gruffalo. 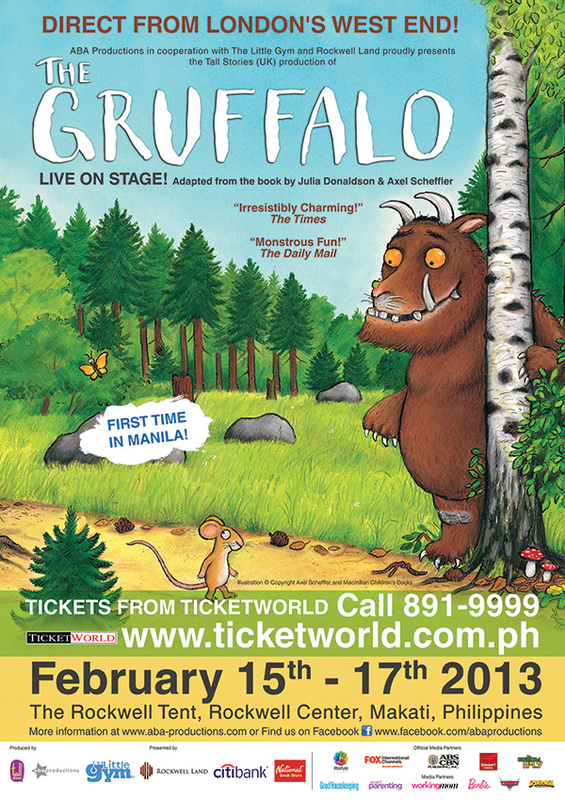 For the very first time in Manila and only for a strictly limited season, The Gruffalo by Julia Donaldson and Axel Scheffler opens on February 15, 2013 at The Rockwell Tent in Makati City. Join Mouse on an adventurous journey through the deep dark wood in this magical musical adaptation of the award-winning book by Julia Donaldson and Axel Scheffler, which has been described by The Observer newspaper in England as “a modern classic.” Mouse can scare hungry animals away with tall stories of the terrifying Gruffalo, but what happens when he comes face to face with the very creature he imagines? The Gruffalo has a special Valentine's Treat! Buy 3 tickets and get 1 free! 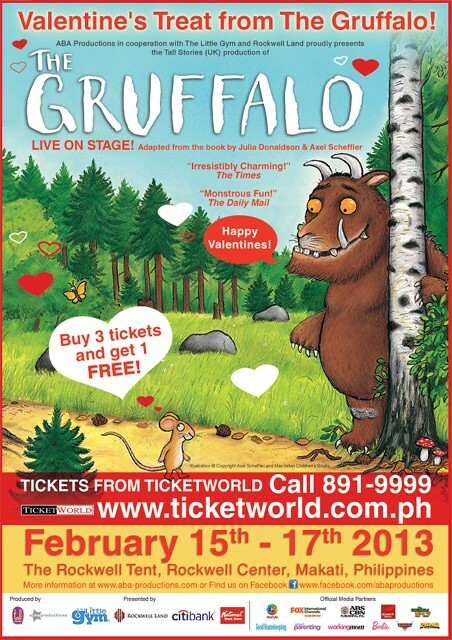 The Gruffalo will be staged at The Rockwell Tent, Makati from February 15 – 17, 2013. Tickets are priced at P900 to P2,200. To book tickets, call 891-9999, or visit Ticketworld’s website www.ticketworld.com.ph.